One of the most nerve-wrecking things most women have is how to prevent those stretch marks during pregnancy. Within nine months you’re supposed to gain 25 to 60+ pounds and pray that some how that skin will stretch with that baby without evidence left by track marks on that skin. Many studies have shown that the best way to protect yourself from these marks are to make sure that belly is kept very hydrated, moist and soaked in oils and belly butters. Once you put these moisturizing products on your belly, they can very easily rub off on your clothes and can cause you two consistently re-apply those creams more than twice a day. I came across this Pure Belly Wrap at the ABC Kids expo a few years ago and knew this was something I wanted to try while pregnant. And sure enough, within a year I am wearing mine just about every day!! So far, after 7 months of use, I have noticed that my skin is super soft when take it off. It feels like the wrap almost “bakes” the moisture in your skin and keeps it very soft and supple. I only have to apply once in the morning, and once in the evening time. 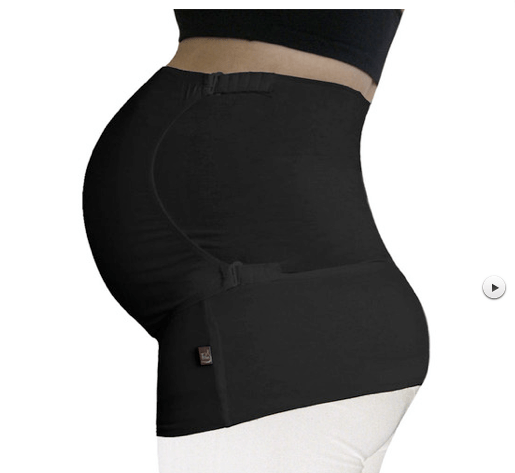 The Pure Belly products are made from organic breathable bamboo and comes in two colors – Black and Organic White (which looks like an off-white color). There are two of the items from Pure Belly that I use. The first one is the Pure Belly Wrap and it looks like this. You slide it on after you’ve applied your oils and/or butters, and then wrap around your belly with the extra flap and hook it on the hooks at the back of the wrap. What’s great about this wrap is that you just need one size as it grows with your belly. There are many loops at the back of the wrap that will allow you to adjust as your belly grows. The second one is the Pure Comfort Backless Tank and it looks like this. I actually like to use this one to bed because I like the support it gives me from my chest to hips. It is made of the same material as the Pure Belly Wrap and keeps my belly just as moist. I simply apply my oils and butters, and then slide this Tank on. I was in no way compensated for this review. These products were provided to me by Pure Belly.